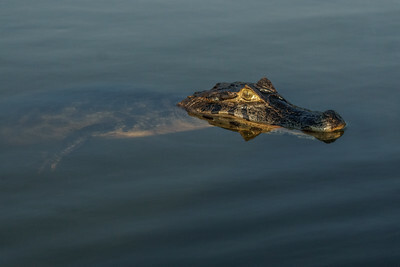 Gliding silently, the caiman seems to have a milder temperament than a croccodile or alligator. This individual was hanging around for a reason, can you see his smile? On our last morning the boat staff "baited" hawks and fish eating birds for the group. This was considered desirable because the bird photographers could get action shots of the big birds grabbing the fish. In my innocence I was shocked that this was how they got those shots. It was not something you'd find in a national US park, but again, there are few rules in the places I visited in Brazil. The men greatly enjoyed doing it and the of course the birds loved it too. At one point one of the men decided to bait the caiman. This was astonishing, he held the fish as high up as he could and the caiman leapt straight up out of the water to catch it, at least 5 feet up. I was praying the reptile had good aim & did not accidentally take the man's arm off. Here we were in this great and vast wilderness and man and beast had developed a relationship similar to the one we have with our dogs and cats when we yell "cookies". All the birds and animals knew from the moment the boat was in position that treats were on the way. The big birds positioned themselves on the other side of the river on a tree snag. They flew in for the fish and then went back to their perch ready to fly at the thrown fish again. Of course PBS has finally let us in on how they make those amazing animal documentaries with "willing individuals" (animals). 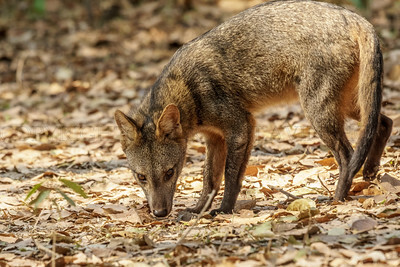 The crab-eating fox (also called the common fox, forest fox or wood fox) is the endemic fox of South and Central America. A few individuals showed up when the food was put out, they were quiet and well camouflaged in the dry forest. They were almost cat-like in their silent appearance. This fox was too far away for me to see clearly with my naked eye, but you can see he/she sees me. The people of the pousada put out enormous quantities of home grown, over ripe, bananas and everyone gets in on it. 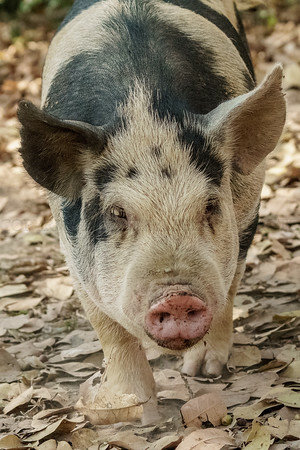 I don't know much about domestic pigs, but I did watch this baby's mother eat those bananas skin and all. The baby chowed down and then just sort of rolled over and fell into a contented sleep. The monkeys were forced to wait until the pigs gave up. There were still plenty of bananas left. In my town bananas range from $.59 to $.79 per pound.